Investor Juan: The PSEi at an All-Time High: Should We Wait? The PSEi at an All-Time High: Should We Wait? I am a newbie in the area of investment and would really appreciate your advice. I have an extra 100k pesos and have been toying around the idea of investing them on BPI Odyssey High Conviction Fund. I am not sure if there is a best time to invest them on such but would really appreciate your opinion whether I invest now when the psei is at it's all time high? Or wait? And should I split the 100k to invest in odyssey and some other fund? Would really appreciate your help. Thanks for your very timely question. Indeed, this current run of the stock market has elicited a lot of public interest in investing, in general, and investing in stocks, in particular. However, many would-be investors such as yourself intuitively have this idea that it's best to enter the market when prices are low and exit when prices are high. And since we have been experiencing all-time highs in stock prices in the past week couple of weeks, questioning the soundness of buying stocks or investing in equity funds now is well founded. But let me first address your choice of funds: the BPI Odyssey High Conviction Fund. Looking at the fund's recent performance and composition, I would not advise you or anyone to invest in this fund for two simple reasons. First, from 2007, at the latest, to mid 2010, the fund has closely tracked the PSEi; since then, it has outperformed the benchmark by a significant margin. Looks good, right? Well, yes, if you bought in at the right time. But if you invest in the fund now, it's highly likely that the fund will go back to "normal" levels and just leave you with worse returns; this is based on the statistical concept of "reversion to the mean," which basically says that significant deviations from the norm or benchmark is not sustainable. In any case, the way I see it the excess returns that the fund has earned since 2010 is primarily due to higher risk, as evidenced by the disproportionate weight given to mining stocks in the fund (please see this post for my arguments against mining stocks), so we can't really say that this fund is better than other funds if we take both risk and return into consideration. Second, with a management fee of 2.50%, the fund charges at least double what "ordinary" equity funds charge; in my opinion, and based on some studies in the US, "expert" fund management more often than not does not deserve paying a premium for. In short, I suggest that you keep it simple and just buy a run-of-the-mill equity fund that charges 1 to 1.25% per year, whenever you do decide to take the plunge. Now let's talk about whether it's a good idea to invest in stocks now given that the PSEi is currently at (or has recently reached) it's all time-high. 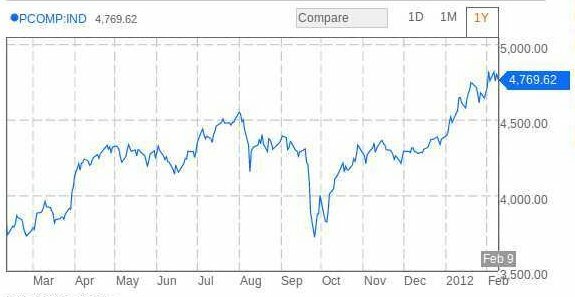 Last year when it was at 4,000, it seemed to me that the PSEi was "too high," and now we all know how wrong (although not necessarily unreasonable) that idea was. In any case, it's really impossible to perfectly time market entry or correctly predict what will happen to the stock market in the foreseeable future. That said, I will not leave you empty-handed. According to experts, indicators point towards a bull market and a continued rise in stock prices, so investing in stocks or any equity fund now may not be a bad idea. For conservatism, though, you might want to keep a portion of your funds as cash, "just in case," especially if you don't have an intact emergency fund yet. Had We Been Had by "Rich Dad, Poor Dad"? Happy Second Birthday to Us!